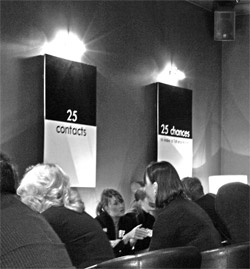 Contact25 organise speed networking events. These include regular speed networking (business-to-business), speed recruiting (employer to employee) and office speed networking (speed networking in the office). Contact25 was created to offer a simpler, easier, faster solution for businesses to find leads and create opportunities. Attendees come together for a series of 15, 5 minute mini-meetings. They have 2 minutes each to talk about their products or services, 30 seconds to score the meeting, then 30 seconds to move on. This is enough time to work out whether there is a potential opportunity to work together. To create a fully integrated website solution including streamlined online bookings for events. As well as this Contact25 needed an online CRM to help the Contact25 organisers to promote the events and an online management area to handle mail-merged print work from the web (to pdfs). There was also a need for a web based table planning algorithm which would keep attendees at the events from meeting each other when they attend more than one event. We achieved the entire brief and Contact25 now generates enquiries from all over the world for their services. To visit their website, click on the link to find out more about speed networking.